Helping Hands Healthcare has a mission to provide affordable home care services to adults or children as we enable them to maintain the highest quality of independent living in their own home. Our caregivers are well-trained, CPR/First Aid certified and have acquired a professional compassionate care to adults and children anywhere from 4 hours at a time to 24/7 including holidays and weekends. Our goal is to help our clients with their personal tasks so they can maintain their normal daily routines while remaining in the comfort of their own homes. 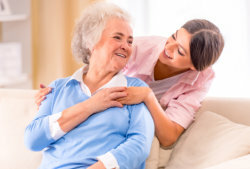 Family members gain peace of mind knowing that their loved one is receiving the highest level of quality personal care. Furthermore, as a licensed home care agency and Home Care Service Provider in Hawaii, we uphold the practice of professional work ethics. When providing care to our clients, we exercise due discretion and confidentiality. Any related information that is discussed in the health, family, and other pertinent details about the client will be preserved with respect to their privacy and dignity. Helping Hands Healthcare provides equal career opportunities for employees and services for clients. In practice of Title VI of the Civil Rights Act of 1964, Section 504 of the Rehabilitation Act of 1973 and the Age Discrimination Act of 1975, our company does not exclude, discriminate or deny benefits to any eligible person, client, customer or employee on the grounds of religion, national origin, gender, disability, sexual orientation, color, race, age, or ethnic background.